The Night Shift feature of iOS shifts the display color profile to be warmer, which reduces blue light output, and makes using an iPhone or iPad display much more pleasant in the later hours of the evening (or early morning). While you can toggle Night Shift mode on and off through Control Center anytime in iOS, perhaps a better approach is to set Night Shift to turn on automatically on a schedule, enabling itself as sunset, and turning itself off at sunrise. This walkthrough will guide you in setting Night Shift to activate automatically on the sun schedule, though you can choose a custom time schedule as well if desired. 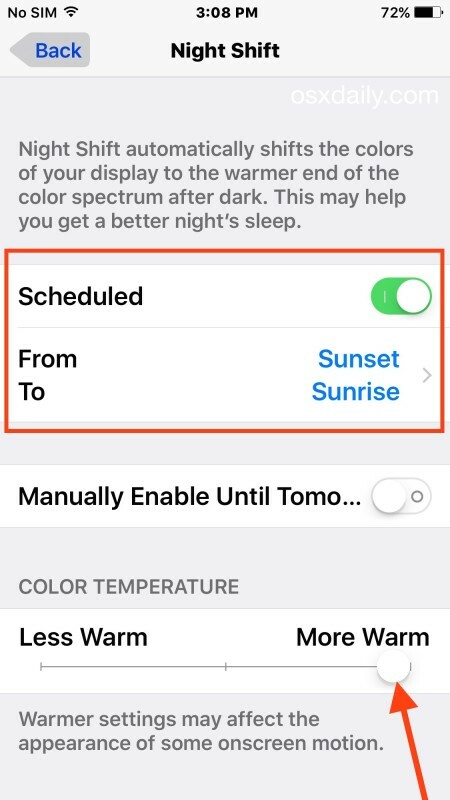 Now when sunset or sunrise comes, the iPhone / iPad display will automatically shift to be warmer, or back to the regular blue-light heavy display. Some users may go to enable Night Shift only to discover the excellent scheduling feature is missing or inaccessible and grayed out. This is almost always due to a setting elsewhere on the device that determines if the Time Zone can be set by location services or not. Now you can return to the Night Shift settings and the scheduling section will be enabled and accessible as intended. 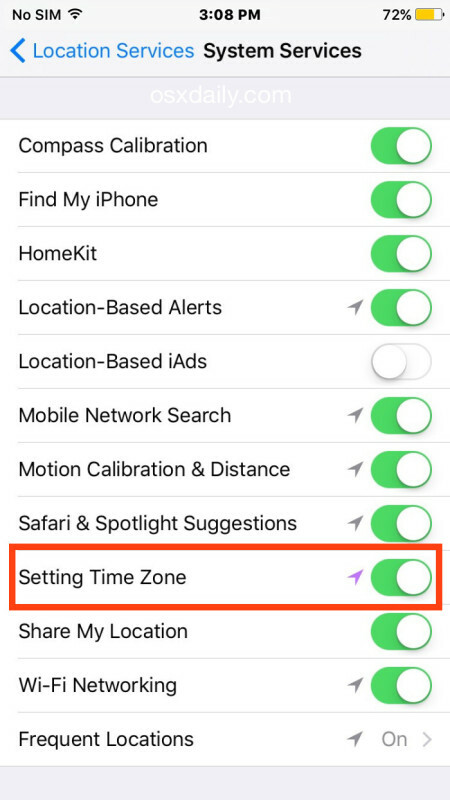 This is a good setting to keep enabled in general, it prevents the problem of time displaying wrong on iPhone and iPad if a device has changed time zones, or has been turned off for a long time. By the way, for the Mac users out there, Flux offers a similar feature and color changing scheduling ability for MacOS X.
I’m hearing that MacOS 10.12 (OS X 10.12, MacOS 11 also possible names) is going to have Night Shift and new redesigned MacBook Pro models will have the True Tone display. Also hearing that Siri is coming to the Mac. Nope. Heard ALL that from other places a LONG time ago. Rumors are just that, and until it comes DIRECTLY from APPLE it’s all just someone guessing. WTF has this got to do with this subject anyway? Nightshift is only available on newer iPhones so don’t waste your time looking for it if you don’t own a new 6 phone.